Great Hills homes for sale are highly sought after within Austin real estate. The area is a part of Travis County. Great Hills real estate offers some of Austin’s most beautiful homes complete with fantastic views. It is conveniently located at the intersection of Loop 360 and Hwy 183, putting residents within 20 minutes of downtown Austin. There is much to love about this idyllic neighborhood. With about 20 different designers, Great Hills homes for sale come in a multitude of styles. Some homes are built in the colonial style with red brick exterior, while others are of a more modern design. Great Hills real estate is known for its curb appeal. There are tree-lined streets and rolling green hills. The neighborhoods are also family-friendly and quiet. Home price ranges from $364,000 to $859,000. Home size ranges from 2,154 square feet to 4,773 square feet. At the heart of Great Hills homes for sale is the Great Hills Country Club. This impressive country club features a clubhouse offering family dining and lounge areas, an 18-hole golf course, 71-par golf course, gorgeous hills and creeks, lighted tennis courts and a junior Olympic size swimming pool, which is heated during the winter. Great Hills real estate is only minutes away from the Arboretum. This shopping center contains retailers like Saks Fifth Avenue, Williams Sonoma, Chico’s and Pottery Barn. Fine dining is also available, including restaurants like Truluck’s, Eddie V’s and Z Tejas. Great Hills homes for sale are served by both the Austin Independent School District on the south end and the Round Rock Independent School District on the north end. Schools in both districts have exemplary ratings. There is also a number of private schools in the area. Parents can be assured their children will receive a quality education when living in Great Hills real estate. Great Hills offers residents ample recreational activities. Great Hills homes for sale are nearby both Great Hills Park and Bull Creek Park, which provide plenty of opportunities for picnicking, swimming, and hiking. Great Hills Park has almost two miles of nature trails in addition to a large variety of wildlife and native plants. The park also boasts a children’s playscape, a covered pavilion with picnic tables, and a native plant garden. Bull Creek Park is scenic 477-acre park. Parts of the park allows dogs off-leash as well. With a unique variety of homes, great shopping and dining options, fantastic schools and plenty of natural beauty, Great Hills real estate is a wonderful choice for homebuyers. It’s no wonder this Northwest Austin community is so well-known and beloved. Rare 0.4523-acre lot with views in Great Hills. 1-Story, 4 bedrooms, 2.5 baths with oversized 2.5 car garage. Feeds to Caraway Elementary, Canyon Vista Middle, and Westwood High. Private, quiet, dead-end street. Granite counters, wood floors. High 9+ foot ceilings. Walk-in pantry. Fireplace. Formal dining. 100% walk-in closets. Wrought iron fence expands views of woods behind lot. Large expanded deck. Sprinkler system. Natural gas. City utilities. Master with garden tub, separate shower, double vanity. Uniquely updated ranch-style home w/diverse & functional floor plan. Picturesque, tree-covered lot w/large xD; xA;oaks. Back porches, covered & uncovered lend you the privacy of country living with rolling, sunlit back yard. Designer painted brick. New interior paint on walls & cabinets. Modern laminate flooring throughout & plush carpet. Breakfast nook with built in bench. Renowned schools. Secluded setting close to everything in North West Austin. Enclosed 485 sq.ft. the sunroom is not included in sq.ft. 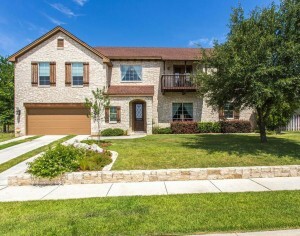 You will find urself live so close to the nature while also locating in the heart of N Austin.Well maintained custom home with Travertine tile, frameless shower, SS appliances,high-end laminate,ample closet space,HUGE walk-in closet, over-sized laundry room and back to GREENBELT. Enjoy panoramic view on this 700SQT composite deck with large covered pergola patio and built in BBQ. Top-rated RRISD schools.EXCELLENT LOCATIN-10 MIN to 3 major road(Mopac,183, 360), Arboretum shopping area, Gateway and Domain. Beautiful single story home in desirable Westover Hills on appr. 1/3 acre lot backing to lush green space! Features include bright, open kitchen & living areas w/ cathedral beamed ceiling, skylights, built-in bookshelves & gas fireplace. Large master suite w/ double vanity & walk-in closet. Carpet replaced Mar. '19. Park-like back yard w/multiple outdoor living spaces, huge covered patio, usable yard space & sports court! Convenient location w/access to major highways, schools, shopping & dining. Unique 1975 Parade of Homes model home with incredible character! Exposed beams and interior stone around 2 fireplaces give this home a European charm. Recent remodeling including updated kitchen and baths, fresh exterior painting, brand new 30 year Tamko shingle roof, additional square footage including new mudroom, living room, and loft office. Wonderful backyard with a pool and yard space, divided by pool safety fence. Great location! Relax & enjoy this exceptional home in desirable NW Austin. Entertain in 3 liv. areas. New nickel fixtures!The home feeds to Laurel Mt. Elem, Canyon Vista Middle & Westwood High, acclaimed RRISD schools! Sit back & enjoy this oversized lot (.3593 acre)w/native landscaping of trees & grapevines. Energy efficiency incl. 2 HVAC systems(SEER 18),tankless water heater, recent energy eff.appliances & gas heat. Rainwater collection too! Flooring incl. engineered hardwoods,porcelain tiles & upgraded carpet.Area! New roof in 2018. xD; xA;Enclosed saltwater pool w/ heater & water feature create a backyard paradise. xD; xA;Nest system to monitor HVAC. xD; xA;Walk to Laurel Mountain Elementary. xD; xA;Highly Rated Round Rock Schools. xD; xA;Pergola & fire place are perfect for outdoor entertaining. xD; xA;Closets, office & garage feature built in organizers. xD; xA;1 bedroom and full bath down. xD; xA;Large master bedroom features a fire place. xD; xA;MosquitoNix misting system. xD; xA;Combination of plantation shutters & Hunter Douglas blinds. xD; xA;Minutes to Arboretum & Domain.